Despite the fact that zombies are no longer limited to the horror genre, you could be surprised to learn of a zombie circus show being performed in the Melbourne International Comedy Festival, but that's exactly what Head First Acrobats have created. Elixir sees three scientists who inadvertently bring forth a zombie apocalypse while trying to create an elixir of life. The scientists - Callan Harris, Harley Timmerman and AJ Saltamacchia (replacing Thomas Gorham just weeks before opening after an injury) - ingest their body enhancing potions and go through various tests that push the capabilities of the human form. Fortunately the three are highly talented circus artists, so the results are quite awe-inspiring. Harris' free-standing ladder routine is a highlight, full of hold-your-breath intensity as he scales the ladder to perform precarious acrobatics and balancing acts. Timmerman's use of the cyr wheel showcases the great control and skill he possesses, using the momentum of the wheel to spin around as he grips it with his hands and feet. 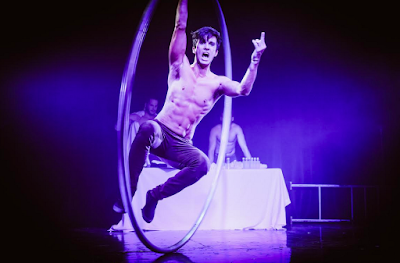 A unique aspect to Elixir is its focus on theatre and telling a story through circus. The story is straightforward enough to follow and while there are some plot holes and inconsistencies, there is enough flesh in this narrative to sink your teeth into. Their zombie portrayals are as realistic as zombies can be with the added ability to throw their bullet-ridden bodies to the floor and then flip back up and come back to un-life. 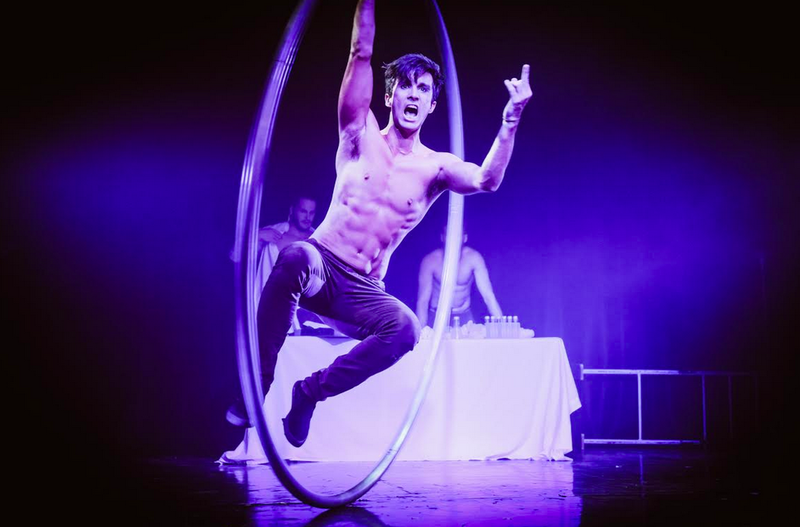 There is plenty of cheeky banter between them (and the audience) and they also make space to include a commentary on masculinity and sexuality, which is refreshing to see from a show with so much male muscle and skin on display. While Elixir was conceived in Melbourne in 2013, this is the first time this production has played here, and the wait is definitely worth it. A fun evening of thrilling circus acts and equally impressive clowning ensure Elixir stays with you until your very last breath as a human. Click here for my interview with Head First Acrobats.